We’ve been celebrating this month for the campaign’s 1st birthday, and Fall Break gave us another great occasion! 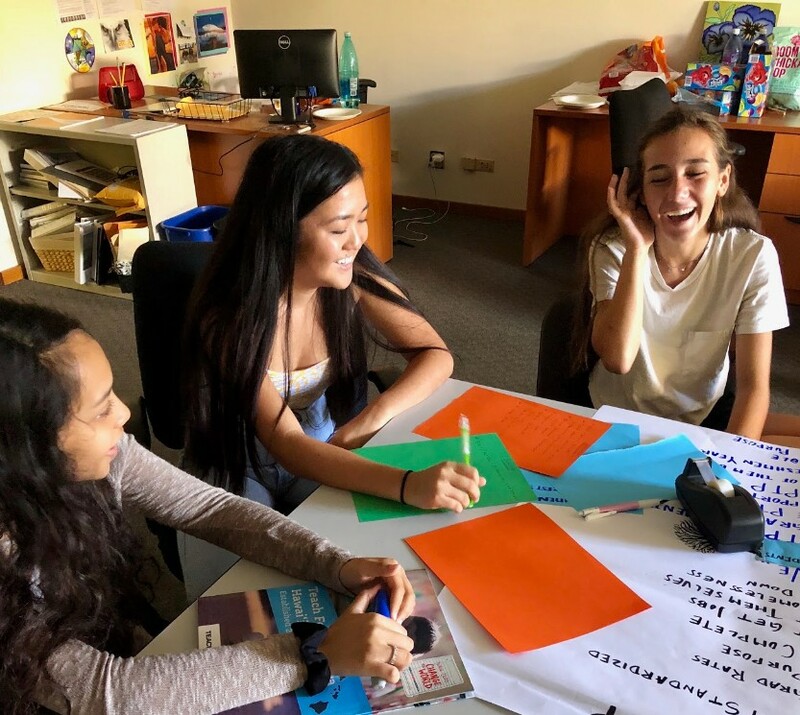 We had student voice at the forefront of our adventures in Oahu and went to Kona to keep the festivities going, in HawaiiKidsCAN style. Here’s a look back at our eventful week. How was yours? Our team joined keiki from across Hawaii for the annual Children and Youth Day celebration at the State Capitol. At our booth in the Teen Zone, we asked students how they would change their schools. 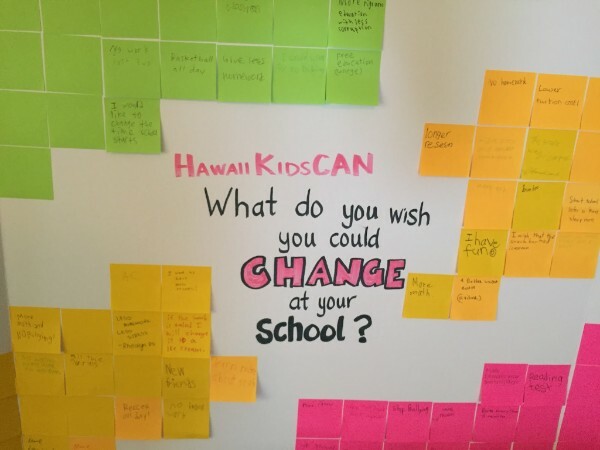 Students shared ideas on what they would like to change about their schools on our interactive idea board. 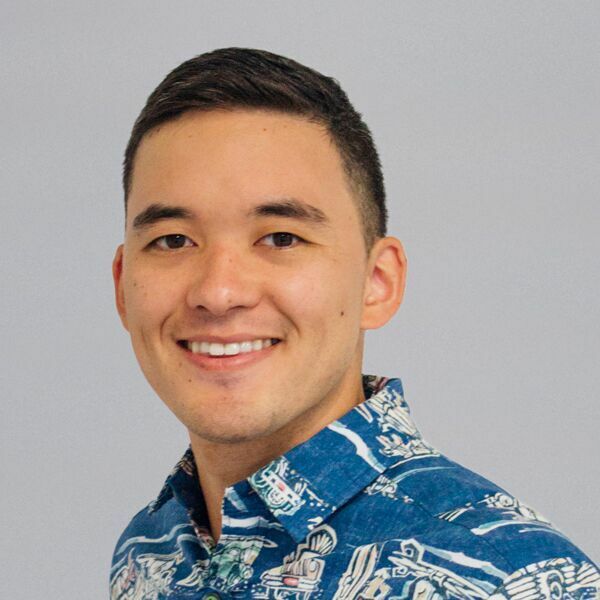 Last spring we held a leadership fellowship with Teach For America-Hawaii and Education Incubator, and it was so fun that we had to do it again! Our goal was to engage students in an internal dialogue about what encourages them to think and act as leaders—in school and beyond. At the end of our three days, those talented youth leaders made commitments for working toward educational equity from Kona. Our community outreach manager, Aisha, led a team of WAVE youth from Oahu and Kona youth to the Hawaii Children & Youth Summit: a day for removing barriers between the islands’ children, young adults and lawmakers. 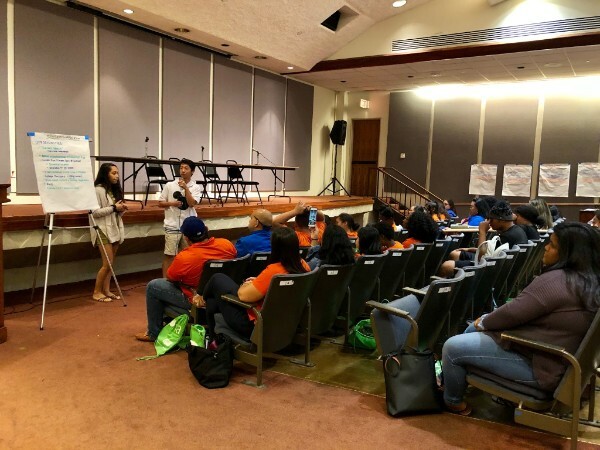 There were more than 200 keiki at the Capitol, discussing their goals for Hawaii schools and communities, with the ultimate goal of coming up with 5 priorities for the 2019 legislative Keiki Caucus package. 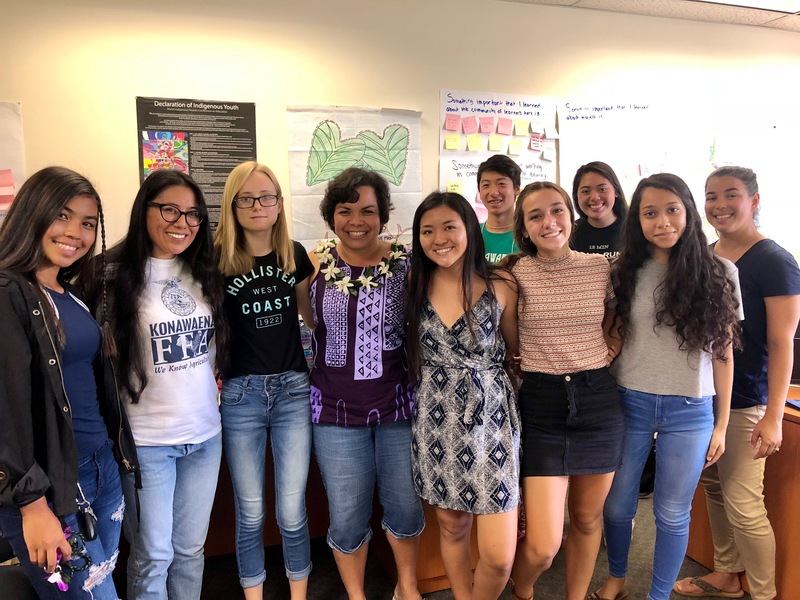 The event brought together young people from across the islands to share their ideas on what is important to them, these ideas will be noted as youth priorities for the Keiki Caucus. In Aisha’s words, “our Oahu WAVE and Alternative Break Kona crews totally rocked the Summit!” Our students were natural leaders in the breakout sessions when it came time for students to present their suggestions, and our WAVE and Kona students were chosen of their peers to deliver six of the eight presentations that reported on their breakout session ideas. The Oahu and Kona crews had such a good time meeting one another. 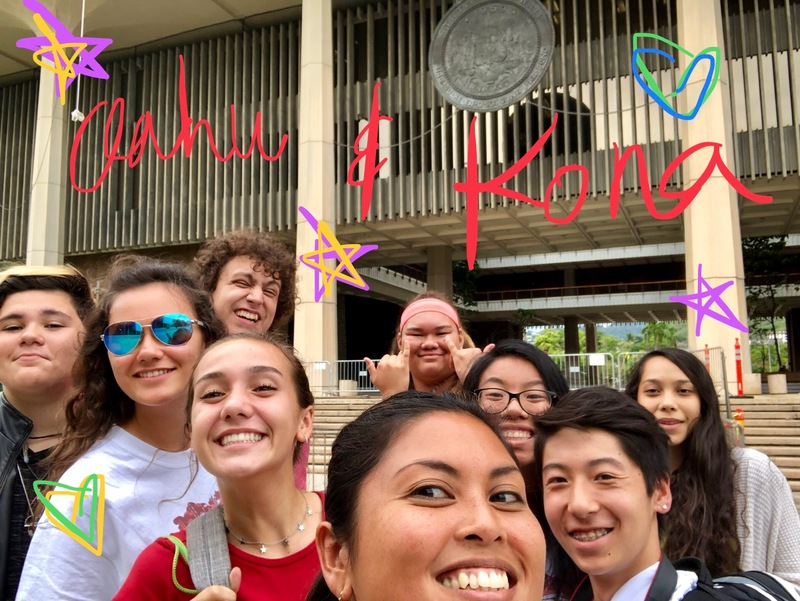 Cade, a junior at Konawaena High School, shared that traveling to Oahu for the Hawaii Children & Youth Summit helped him meet like-minded students who care about making positive impacts in their communities, and that traveling from Kona to Oahu was a unique experience that not all students are privileged to have. Our Fall Break was a blast, and quite a celebration of student voice and sharing ideas for educational equity across islands. If you believe in our work, there’s still time to make a birthday gift of any amount. Our board members will match your donation—and you’ll help us run more great programs like these.